Arrival is Amy Adams. This is a point worth making because Adams appears in every scene; it is also important for the fact that rarely does a female character dominate a Hollywood movie to such an extent. All the better for the movie, because Arrival is good, original, science fiction. A lot like Contact in themes and feel (as well as in clunkiness), Arrival deals with humanity’s handling of first contact by aliens. In Arrival’s case, these take the form of mysterious spaceships touching down at 12 places around the earth. For the American spaceship, military authorities pick on a credible linguist (Adams) for the task of establishing communication with the aliens. She is joined by a physicist (Jeremy Renner), whose main role in the movie is to supply that secondary role females tend to provide to the male lead in most other movies. Only that Adams’ character is heavily burdened by losing her teenage daughter to cancer, therefore putting to question her professional abilities. Or perhaps enhancing them? I will not delve further into the plot. Suffice to say Arrival is driven by interesting science fictional ideas. 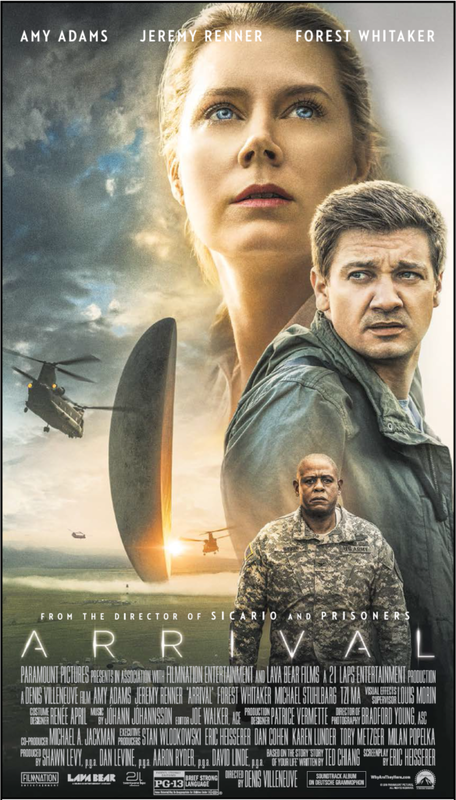 Ultimately, though, Arrival is not an aliens genre movie but rather a very human centric movie about the choices us humans make on a daily basis. Which renders Arrival into proper science fiction. The type that takes rarely considered concepts off Einstein’s Theory of Relativity and projects elements of fantasy into them so as to make a point about our world of today. Overall: While never truly thrilling, Arrival is one of those movies that make one think. Coupled with Adams’ performance, it is a film well worth watching at 3.5 out of 5 crabs.